A three blade drum fan in metal finish. Multi directional dispersion of air by with 360 degree adjustment. Automatice overheat shut off for safety. 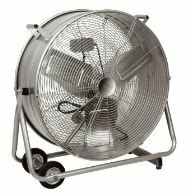 A powerfull 430 Watt motor and 3 speed fan adjustment makes this unit a powerfull drum fan. This product can only be ordered in singularly. 30 inch blade diameter.